Home / Food Making Videos / Egg Chop Making - முட்டை சாப் செய்யும் முறை !!! Egg Chop Making - முட்டை சாப் செய்யும் முறை !!! 1. Heat some oil in a pan add chopped onions, salt saute it and add chopped green chilies, turmeric powder, chopped mint, coriander powder, cumin powder, garam masala powder cook this till onions are slightly cooked and soft. 2. Transfer this into a bowl and add grated boiled potatoes, chopped boiled eggs, add bread crumbs mix it well and make them round balls and flatten them to make large chops. 3. Make seasoned flour with red Chili powder and salt. 4. Dredge the chops with the flour and then dip it in the well beaten egg white and shallow fry it in the oil. Top the chop with rest of the beaten egg white to form a lacy edge on the chop. 5. 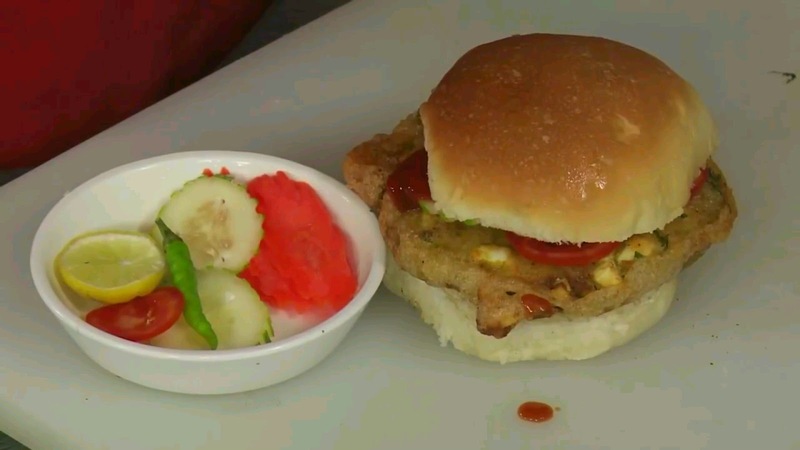 Serve it hot in a grilled bun topped up with tomato ketchup and salad veggies.